The Solution below shows the B# harmonic minor key signature on the treble clef and bass clef. This step shows the enharmonic equivalent of the B# harmonic minor scale key signature on the treble and bass clef, including the note name adjustments relative to the natural minor scale in the same key. The B-sharp harmonic minor scale has 4 sharps, 3 double-sharps. Warning: The B-sharp key is a theoretical harmonic minor scale key. > There is always an identical harmonic minor scale that you can use in its place, which is on the Circle of 5ths. > The C harmonic minor scale sounds the same / contains the same note pitches, which are played in the same order, and so it can be used as a direct replacement for the B-sharp harmonic minor scale. Rather than use a key signature that would in theory contain double sharps or flats, usually the key signature of the replacement minor scale C, above is used, as shown below. The B# harmonic minor scale has 4 sharps, 3 double-sharps. To understand why the B-sharp harmonic minor scale has 4 sharps, 3 double-sharps, have a look at the B# harmonic minor scale page, which shows how to identify the note positions and names for this scale. This harmonic minor scale is based a natural minor scale that is not on the circle of 5ths - B# natural minor scale, which means that its key signature would have double sharps or flats. So rather than use this complex key signature, usually the key signature of a simpler equivalent scale would be used. In ths case, the harmonic minor scale having the same note pitches played in the same order is the C harmonic minor scale, so its key signature will be used instead below. The next step will show the C natural minor key signature as a basis for calculating this harmonic minor key signature. The C natural minor key signature has 3 flats, which is different to the harmonic minor scale above. 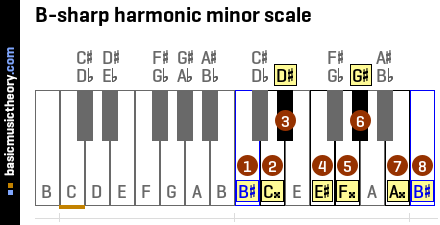 To calculate the C harmonic minor scale from the C natural minor scale, the 7th note position of the natural minor scale - note Bb is raised by one half-tone / semitone, as shown in the next step. This step shows the C harmonic minor key signature on a treble and bass clef, together with a table showing the note adjustments that need to be made relative to the natural minor scale.